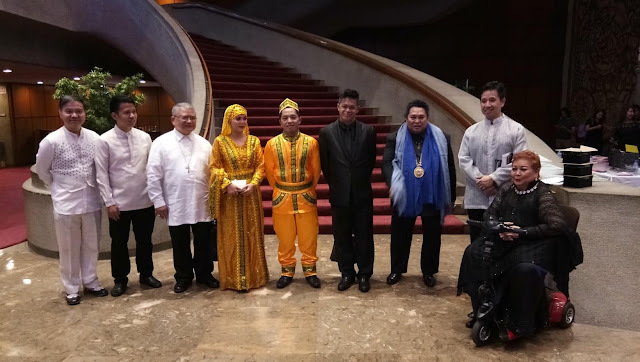 Lyric Opera of the Philippines (LyrOpera), a non-stock non-profit opera company incorporated in 2016, honored Filipino Classical Singers that served a living legends in the art of opera with their passion and dedication. Fides Cuyugan-Asencio, Francisco Carlson Aseniero, Gloria Dizon-Coronel, Irma Ponce Enrile Potenciano, Armida Ponce Enrile Siguion-Reyna, Jose Santos, Teresita Agana-Santos and Noel Espiritu Velasco, their contribution were recognized prelude to the show. The pillars of Philippine Fashion were also given recognition whose artistry and creativity made a testament and statement in the world of fashion. Ramon Valera, Pitoy Moreno, Ben Ferrales, Aureo Alonzo, Christian Espiritu, Joe Salazar and Salvacion Lim-Higgins were just some of notable Filipino couturiers who proudly interpreted and represented their creations with such uniqueness. Some of their creations were on display at the Main Theater Lobby for the new generation to see. THE BEST OF OPERA featured an all-Filipino cast from the Lyric Opera of the Philippines, chaired by celebrated Filipino soprano, Maestra Irma Ponce Enrile-Potenciano. Best-loved arias and songs from Tosca (E lucevan le stelle performed by Randy Gilongo, tenor), Carmen (Toreador performed by Noel Azcona, baritone with Cast & Faith Gospel Singers), La Traviata (E'strano, Ah! Fors'e Lui and Sempre Libera performed by Naomi Sison, soprano), Rigoletto (La Donna e mobile performed by John Glenn Gaerlan, tenor and Bella figlia dell'amore performed by Rigoletto quartet Naomi Sison, Ana Feleo, Randy Gilongo and Noel Azarcon), Pagliacci (Vesti la giubba performed by Sherwin Sozon, tenor), Samson et Dalila (Amour! viens aider ma faiblesse! performed by Ana Feleo, soprano), La Boheme (Donde lieta usci performed by Mary Patrice Pacis, soprano), Rusalka (Mesicku na nebi hiubokem performed by Tonton Pascual, soprano), Madama Butterfly (Un bel di vedremo performed by Rica Nepomuceno, soprano) and Turandot (Nessun Dorma performed by the whole ensemble. The Act 1 presentation was accompanied by the 70-piece UST Symphony Orchestra with Maestro William Barkhymer and was directed by internationally acclaimed filmmaker Carlitos Siguion Reyna. THE BEST OF FASHION became a gathering of the biggest ever fashion for a cause project showcasing over 100 fashion and jewelry designers, fashion directors and choreographers, hairstylists and make-up artists, fashion models and muses and beauty queens. Directed by Raymond Villanueva and Nathan De Leon and conceptualized by Zardo A. Austria, the cultural fashion show reminisced and relived " The Pomp and Pageantry of Philippine Carnival Queens " as it highlighted the Filipino beauty and talent in a breathtaking parade of modern Filipina creations inspired from the glorious, bygone era of the Carnival Queens circa 1908 - 1939, undoubtedly became the precursor of modern day beauty pageants pre and post the war. The country's top and talented couturiers who participated were Edgar Allan, Ronaldo Arnaldo, Eddie Baddeo, Delby Bragais, Steve de Leon, Peri Diaz, Toni Galang, Rocky Gathercole, Nolie Hans, Roland Lirio, Ricci Lizaso, Jojie Lloren, Edgar Madamba, Jontie Martinez, Ole Morabe, Jerome Navarro, Richard Papa, Oskar Peralta, Lito Perez, Joyce Peñas Pilarsky, Rholand Roxas, Renee Salud, Ditta Sandico, Edgar San Diego, Cary Santiago, Fanny Serrano, Haute Couture jewelry designer Gerry Ereñeta Sunga and Turn-of-the-century Filipiniana accessories of Felizo. The Act II presentation was a grandeur display aura of Filipino ingenuity, music and cultural heritage as Maestro Herminigildo Ranera conducted the UST Symphony Orchestra as classic kundiman, folk songs and pop tunes were immortalized. Beauty queens and muses paraded with such grace and poise wearing the fabled Filipiniana designed motifs from the traditional Carnival Queen period baro't saya, traje de mestiza and Maria Clara, the fantastic Filipiniana design inspired from the costume balls of the era, the goddesses: terrestrial, sea, fire and metal and celestial and the fabulous Filipiniana of the Kahirup Ball and Mancomunidad Ball and from Carnival Queen to Miss Philippines. Presented by the Cultural Center of the Philippines and The Lyric Opera of the Philippines in cooperation with E. Zobel Foundation Inc., MARAWING SALAMAT: The Best Of Philippine Opera And Fashion happened at the CCP Main Theater on April 6, 2018 at 8pm. Duyog Marawi project of the Prelature of St. Mary was unanimously chosen as the sole beneficiary of this fundraising event for its rehabilitation.